Well . . . maybe? As Sam Wineburg has learned through extensive study of how we teach history and whether it works, we’ve always been bad at teaching history. And there really wasn’t ever a “golden age of fact retention.” So maybe we should just give up on drilling facts into kids and let their surfing fingers lead them to the knowledge they need, when they need it? Well, that’s a problem, too, Wineburg shows in his book Why Learn History (When It’s Already on Your Phone). The solution to our historically ineffective methods of teaching history (rote memorization among them) isn’t to stop teaching history: it’s to teach it better, using the knowledge we’ve gained through studies of what actually works. And a big part of that is figuring out how to give students the knowledge and critical thinking skills they’ll need to navigate a world of often suspect online information. Only by combining the two–giving students a sense of what history is and why it matters while also showing them how to use online news and sources with an effective amount of diligence and skepticism–will we start putting our confused, fractured society and political environment back together. Sam covered all this and much more yesterday in talking with Michael Krasny of KQED’s Forum. 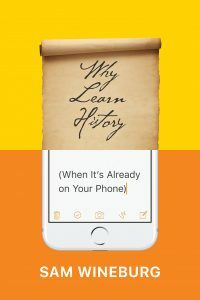 For more on the problems with our teaching of history, you can check out Rebecca Onion’s interview and read an excerpt from the book at Slate.